The Philippines could learn some lessons from the Indian Ocean tsunami. Like the 2004 tidal wave, typhoon Haiyan has caused death and destruction. The next challenge is to manage the economic distortions caused by rebuilding. The human cost of the super-typhoon that ripped through central Philippines is all too apparent: the storm destroyed up to 80 percent of the structures in its path, killing an estimated 10,000 people in just one city. The economic consequences are less clear: HSBC economists put the damage at between 0.16 percent and 1.4 percent of the nation’s $272 billion GDP. But that’s just lost output. The true extent of the devastation will only be known after the onerous task of replacing destroyed dwellings and infrastructure begins. Even before then, though, Manila can draw some lessons from the tsunami. The first is that rebuilding and repair may be far more expensive than they initially appear. The cost of reconstructing a road in Aceh, Indonesia shot up from a March 2005 forecast of $1.6 million per mile to $2.7 million just 13 months later. Among the reasons: an 81 percent jump in construction supervisors’ wages, according to the U.S. Government Accountability Office. Wages of masons in Galle, Sri Lanka soared 50 to 90 percent in the year after the calamity. Those wage spikes occurred because farmers and fishermen lost their livelihoods, so their ability to pay for new homes was lower – even with subsidies. At the same time, reconstruction caused a sudden shortage of bricklayers, plumbers and painters. The second lesson is that the problem could get worse if foreign aid ends up pushing the local currency higher, as in Sri Lanka in 2005. The combination of pricier labour and a stronger exchange rate hurts export competitiveness just when a country is trying to get back on its feet. A big chunk of the Philippines’ output comes from the capital region, which wasn’t in the typhoon’s path. Hence the economy, which has seen four quarters of above 7 percent GDP growth, will probably retain its momentum. But sustained expansion also means that, unlike tsunami-affected Thailand in 2005, the Philippines economy doesn’t have much slack. Unless the authorities are careful, foreign-funded reconstruction could trigger a wage-price spiral. That will compound the original tragedy. 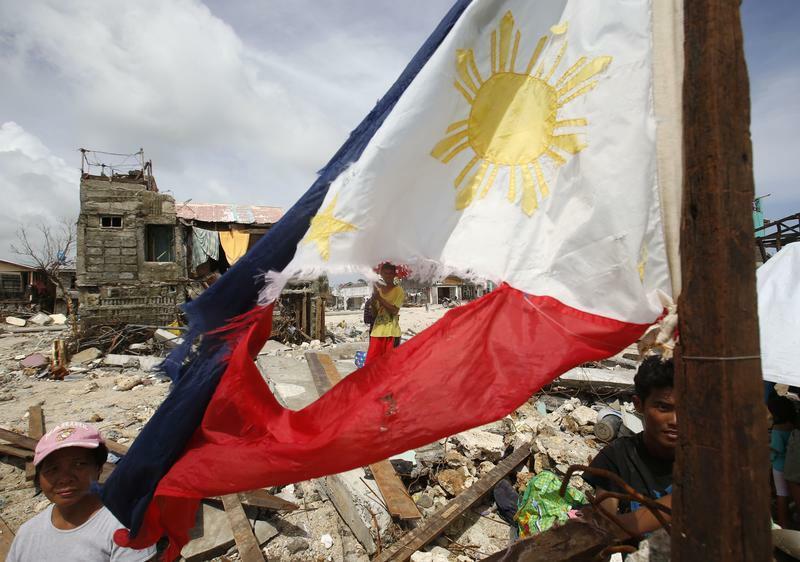 Typhoon victims wait for relief supplies near a tattered Philippine flag in Hernani, Samar, that was hit by super Typhoon Haiyan in central Philippines November 11, 2013. Super typhoon Haiyan, which tore through the Leyte province of the Philippines on Nov. 8, killed 10,000 people in just one city, displacing more than 600,000 and damaging up to 80 percent of the structures in its path, according to Reuters reports citing estimates by government sources and the United Nations’ Office for the Coordination of Humanitarian Affairs. The Philippines Composite stock index dropped 1.4 percent on Nov. 11, while the peso declined 0.9 percent against the U.S. dollar in onshore trading. President Benigno Aquino said in a televised address that the government has 18.7 billion pesos ($433 million) to fund rehabilitation.